Learn the common basketball fouls and referee hand signals found in college, high school, and youth basketball rules. Not all contact on the basketball court is illegal, but there are some specific fouls outlined in the rules that are designed to keep the contact from becoming too aggressive. In the early history of basketball, before there were any standardized regulations, play could pretty rough at times. Over time, rules regarding basketball fouls and violations were put into place to keep the game under control. The first thing you need to know is that basketball fouls and violations are not the same thing. A foul is a penalty called by the referee for rough play to keep a player from gaining an advantage over another player. It's an infraction of the rules that results in a player being charged and penalized. Each player is allowed 5 basketball fouls before they're removed from the game. When a player commits a foul, the ball is awarded out of bounds to the opposing team, unless the foul occurs during the act of shooting. A shooter who is fouled is awarded 1, 2 or 3 free throws depending on the location of the foul and whether or not the shot went in. A violation, on the other hand, is an infraction of the rules of basketball that cause a team to lose possession of the ball. There are no free throws taken when a violation occurs. These are just a few of the violations that occur during a game. When the defender makes illegal personal contact with an opponent who may or may not have the ball. 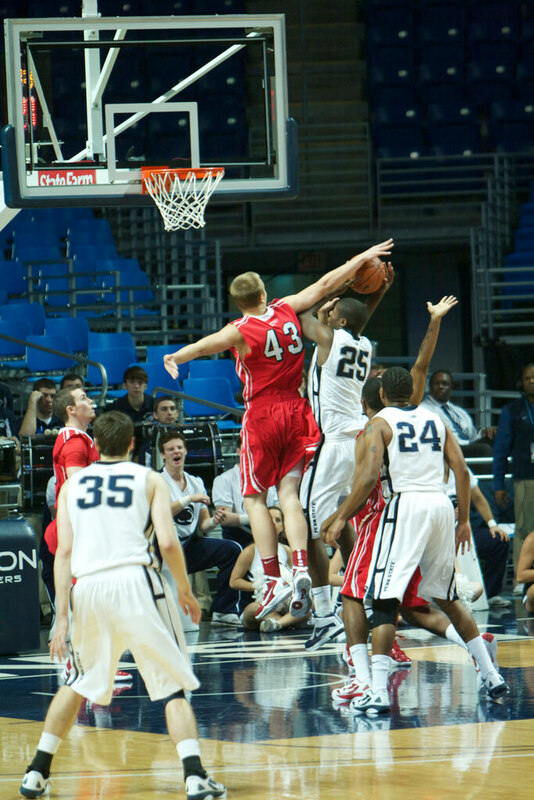 Blocking is called when the defender impedes the progress of the opponent. When an offensive player makes contact with a defender who has already established a set position. A player with the ball must avoid contact with a stationary defender by stopping or changing direction. When two opponents commit fouls against each other at the same time. When a player with the ball swings his elbows excessively and makes contact with a defender. A personal or technical foul, which is violent in nature. Examples: fighting, striking, kicking, or kneeing an opponent. Consequences: Fouled player shoots two free throws, his team gets possession of the basketball out of bounds, and the player committing the foul is kicked out of the game. When a defender makes repeated contact with her hands on her opponent. Grabbing or touching an opponent to interfere with his freedom of movement. Form of blocking that occurs when a player setting a screen is still moving at the time the defender makes contact with her. The intention is to prevent the defender from getting around the screen. A personal or technical foul, which keeps the opponent from capitalizing on an advantageous situation. Could be contact away from the ball or contact when a defender is not making a legitimate attempt to play the ball or a player. Also occurs when a player causes excessive contact with an opponent. An intentional foul results in two free throws and possession of the basketball out of bounds for the player that was fouled. A foul caused by an offensive player, usually in the form of charging. When a player jumps on or over the back of an opponent. It usually occurs when players are battling for rebounds or when a defender takes a shooter's pump fake and comes down on top of him. Illegal contact with an opponent while the ball is live, which hinders the opponent's offensive or defensive movement. Also includes contact by or on an airborne shooter when the ball is dead. It results in possession of the ball out of bounds and a 1-and-1 free throw situation for the team that was fouled if they are above their foul limit. When an offensive player in possession of the ball makes contact with a defender who has already established a set position. A player with the ball must avoid contact with a stationary defender by stopping or changing direction. When a player excessively pushes or bumps into an opponent. It usually occurs when players are fighting to get position for a rebound or when a defensive player shoves a shooter or dribbler. When a defender attempting to steal the basketball reaches in with her hands and makes contact with the ball handler. A foul called when a player is in the act of shooting. If the shooter makes the shot, she is awarded one free throw. If she misses the shot, she gets two free throws unless she was fouled beyond the 3-point line in which case she is granted three free throws. Any foul charged to a team. Once a team reaches 7 team fouls, its opponent is in a bonus free throw situation. A non-contact foul by a player; an intentional or flagrant contact foul while the ball is dead; or a violation charged to the head coach because of violations on the sideline or from bench personnel. A technical foul results in two free throws and possession of the ball out of bounds. Using the foot or leg to cause an opponent to fall or lose his balance. Click here to go to the National Federation of State High School Associations (NFHS) web page where you can find more info about basketball fouls and violations along with the latest rule changes and interpretations.